This entry was posted in Boat Living, Cheap Tricks, Relationships by Melissa. Bookmark the permalink. Indeed, so true! I sometimes wonder if the new boats, marketed more to women than they were in the 1970’s when this boat was built, have more storage meant for shoes. Ah yes, the dreaded shoe dilemma. Even though I’ve never been a shoe person, it’s still difficult to find space for all the ones I need — hiking, running, Keens (for the boat), Uggs, sandals and more. I foolishly decided to keep some in storage this year and am missing the selection. I like your storage solution though. It’s a great use of space! It’s only a dilemma for people who don’t want to give in to their desire for several pair. I figure, if I can store them, I can have them. I love this post! But do NOT get rid of any shoes! You will lose some overboard when beaching the dinghy, you will wear them out, and you will not be able to find a decent new pair! Hide them from that evil man, but for god’s sake do not get rid of them!! Ahhhhh. Now THIS is a comment met with appreciation! I never even thought about how I might lose some. ONly how I will wear them out, especially considering that some of them are close to that state now. It is clear we are kindred spirits. I’m reasonably sure that this shoe fetish which women seem to universally embrace is the rout cause of all relational conflict. The good town/walking shoes double as hikers. Really, if you decide to climb a mountain in Mexico, you’ll find that Mexicans wear shoes too, and you can buy a pair. Really, it’s true! I hear you cry. Good luck! But I’m on Mike’s side for this one. I just found 6 pair of Nicki’ s shoes under the salon table, and she is barefoot! In my defense, I did call you a terrible person in the most loving and Christlike way. Also, I did not witness your efforts to fit my shoes into your admittedly elegant storage solution and so have my doubts as to how hard you really tried. We will discuss this later. I will prove to you that your shoes are to large and unwieldy to fit in those small space. Ha! So there. Don’t forget shoes for walking in the desert such as Sea of Cortez islands (gravel, dust, sharp cacti)…. Speaking of Sea of Cortez, don’t spend money on paper charts unless they are the NEWER ones produced by SEMAR Mexico. All the rest are pretty useless. (But I think you know that already…. I hope my tennis type shoes will suffice for walking in the desert. The last time we were there, I did notice that the going is really rough in that desert! Honestly, it feels like the vultures are just waiting. 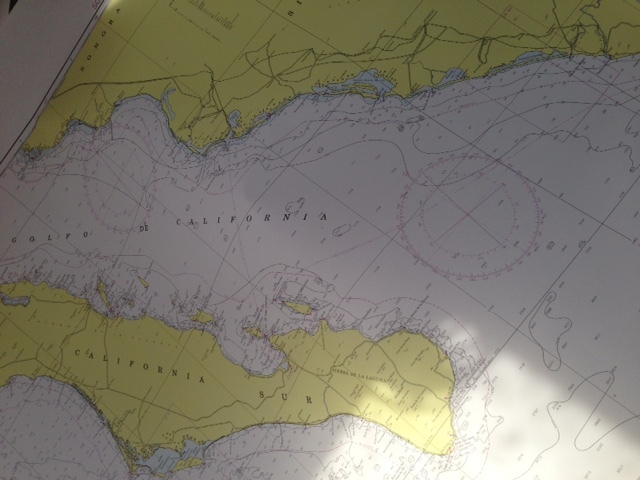 We got our charts from Seabreeze Books and Charts in San Diego. They are the only place, I think, that sells the latest models. We do like paper charts, even if just for planning and being able to see the big picture. The NGA charts sold by Seabreeze are DMA maps hopelessly out of date. When in San Diego, go to SEMAR office in Ensenada for real charts. These are the charts by SEMAR, used by the Mexican navy. They say SEMAR on the bottom. Not the DMA maps. They are 2006, so not completely current, but probably as good as we can get. After all, we have multiple ways of plotting a course. I know, right? What is it about men that keeps them from understanding this one, simple fact? What a perfect spot to store entirely too many boat shoes! I love it! LOL! Well, our problem is that while we have lived aboard for several months, we will be taking our boat to a completely different climate. So I’m trying to remember what it was like living in heat, and buying my shoes accordingly. This is funny…DON’T get rid of your shoes….. I consider this permission to keep as many as I want! Tell Mike to count his blessings. My wife is a boot woman. Let us not discuss boots. Let’s just not go there, k? Only 9 pair? What kind of woman are you? Hmmm, I was counting my “boat shoes” in my head. Two pairs of leather Sperry, (navy and natural, I’d have the pink ones two if I hadn’t procrastinated in buying them), Teva’s, two pair of flip flops, birkenstock sandals, slippers, (cold in Michigan sometimes), and a pair of dressy sandals. Only 8 pair. Darn. But, the total actually changes depending on what I wear to the boat from work. I lost one pair of sandal to a leaky gas line in our dinghy, one pair of “water shoes” that just stank after a period of time and one pair of Teva’s that fell apart after only 15 years. Imagine. I agree with Karen, see what you wear after a year and then send the rest home. Well, these are just my sandals. I have a pair of Sperry boat shoes, three pairs of boots in addition to my sailing boots, and three pairs of tennis shoe type shoes. The problem is that I needed boots during our wet winter and I’m not quite at the point where wearing my sailing boots to the store is ok with me. The truth is that I will ditch a number of these pairs of shoes after the haulout. I’m saving one pair of tennis shoes just for the boat yard. Then they are history. But I’m keeping ALL the sandals. I am very interested in hearing more about this skin care routine! What products do you use? I am using the O Hui Age Recovery system. It’s pretty good and you can get it on Amazon. The products are really large so I expect the set I recently bought to last me over a year. You can google ‘korean skin care’ and find a lot of information about the Korean approach. Oh, I already know quite a bit about the Korean approach, I’m mostly waiting for my western products to run out so I can justify K-beauty products. I hear that! This is the only K brand I’ve tried. I wanted something to give my skin extra care for this upcoming trip since I’ll be in the sun so much.